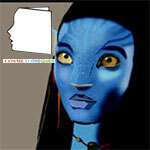 Home Articles Cosmetotheque Ingredients The myth of blue skin: the return? The first references to blue skin can be found in mythology… and are also found in large TV sagas or comic strips. But this colour is not very common on the faces we see on the street… What if, after the trend towards white skin, the myth of blue skin, and its corollary, methylene blue, returned to the taste of the day? In Avatar or Braveheart, blue skin was the order of the day. This practice, quite widely developed in certain ancient cultures, probably had as its origin the use of a particular plant, the leaves of Isatis Tinctoria, whose common name is Pastel, or Pastel of the Dyers, which the interested parties passed on the skin, face and body confused, and which, by oxidation ended up transforming into a more or less characteristic blue color. This practice seems to have led to the popular expression:"… be scared to death !!!!! ", which would refer to the Roman legions who, seeing hordes of blue fighters, would have fed a panic fear. One can also evoke the manifestations of argyrism, this affection caused by excessive silver ingestion, in the form of silver metal dust or silver compounds, and which gives the skin a bluish color. Argyrism occurs in people who eat, breathe or drink silver salts, usually for a long period of time. One also finds in the mythology mentions concerning the blue skin: the Atlanteans, the gods with the blue skin, etc.. Later, the Smurfs resumed this practice, but in a more peaceful and sympathetic way. But nowadays, would the myth of blue skin become a new practice again? A study recently published in Scientific Reports analyzed the anti-aging potential of methylene blue on human skin. University of Maryland researchers tested its action for four weeks on fibroblasts from healthy subjects and others suffering from progeria (a genetic disease in which aging is accelerated). They found that methylene blue is more effective than known substances, stimulating proliferation of skin fibroblasts and delaying cell senescence. Applied to a 3D skin model, it demonstrated in addition to skin viability, promoted healing and increased hydration and thickness of the dermis. Finally, analysis of the expression of the genes involved showed that the treatment altered the expression of a subset of the skin's extracellular matrix proteins, including an increase in elastin and collagen, two essential elements for healthy skin. Finally, this study suggests that methylene blue has great potential for skin care due, among other things, to its antioxidant properties. In this study, methylene blue was also shown to have neuroprotective effects in Alzheimer's disease. See on this subject the article Anti-Aging Potentials of Methylene Blue for Human Skin Longevity on Nature's website. Methylene blue is a product that was first manufactured in 1876 by a German chemist, Heinrich Caro. At the time, it was believed to have many properties against malaria or antiseptics, for example, even if they were not always proven. This grandmother's remedy had fallen into disuse, particularly because of its high toxic metal content, but has just been purified by a Marseilles company. In the summer of 2016, it even obtained a marketing authorization in the United States and a positive opinion from the French agency ANSM. It allows nowadays the treatment of certain intoxications like methemoglobinemia, whose manifestation is strongly associated with the excessive use of poppers!!!!! Many other applications are also envisaged . But it is also a particularly powerful dye that has many chemical virtues. Biological membranes let it pass easily: soluble in water and organic solvents, this molecule even enters cellular compartments, such as mitochondria or the nucleus. The consequence of all this is that it also durably impregnates the skin, at least the epidermis, like all colorants (soluble coloring materials, not to be confused with insoluble pigments), to give it a completely characteristic hue, blue!!!!! One hundred and forty years after its creation, methylene blue still seems to be relevant. So when's the blue skin coming back? Contribution made by Jean Claude Le Joliff A biologist by training, Jean Claude Le Joliff was an R&D man for many years. Successively in charge of R&D, then of Research and Innovation in a large French cosmetics and luxury group, and after an experience of creating a research centre (CERIES), he turned to innovation management. He has also been an Associate Professor at the University of Versailles, Saint Quentin (UVSQ) and remains a lecturer in several specialized courses: ISIPCA, IPIL, ITECH, UBS, UCO, SFC, etc. He is the founder of inn2c, an R&D and Innovation consulting company. Consultant for several international companies, he has actively participated in projects like Filorga, Aïny, Fareva, and many others. He created the Cosmétothèque®, the industry's first conservatory of crafts and know-how.